The country's music scene has birthed many notable opera singers such as Yusif Eyvazov, Dinara Aliyeva, Elchin Azizov, Inara Babayeva, Avez Abdullayev, Medina Mugamova, etc. This list can't be completed without incredible young and talented opera singer Maharram Huseynov. Maharram is one of the well-known Azerbaijani opera singers worldwide. For many years, his soulful voice has mesmerized listeners from around the globe. Maharram's voice touches the deepest feelings in the human heart. Maharram Huseynov made his debut on the stage of the Roman Opera House in "Cinderella" opera by Gioacchino Rossini, where he performed the part of Dandini. His name was added to the "Golden Book" of young talents of Azerbaijan in 2011. In 2017, he became the youngest soloist, who appeared in the role of Don Juan. 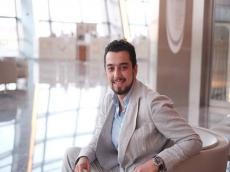 In an interview with Azernews, opera singer shared his recent achievements and future plans. A good teacher can inspire us and instill a love of learning. For many years, Maharram Huseynov has been guided by his signing teacher who played a significant role in his life. "I have been studying in the conservatory with my teacher Svetlana Mirzoyeva since I was ten. She is an assistant professor at the conservatory. I went to Svetlana Mirzoyeva already having the intention to become an opera singer. I really liked opera and classic music since my childhood. Svetlana Mirzoyeva is still my teacher. Despite the fact that I am in Milan, we often contact. I always ask her advice, and send my records," said Huseynov. While we appreciate singer's voice, deep emotions he draws on in each performance can't cease to amaze as well. "I like to immense myself into a role and music. I really enjoy this moment. Especially when my voice is well suited for the role," he said. What is the secret of success? Everyone has his or her own individual definition. For Maharram, the secret of success lies in hard work. "In general, I can say that success comes to a person when he works hard, plunges himself into the vocal party and music. All these probably bring success. It's also important how you look on stage, how you interpret the role. All these moments are very important," said Maharram. Maharram once again distinguished himself, having won the hearts of the people around him right at the train station in Geneva, Switzerland. By the way, opera singer had recently fascinated music lovers in Switzerland. Maharram took part in opera L'elisir d'amore (The Elixir of Love) by Italian composer Gaetano Donizetti in La Scala. It was presented for the first time last November. Ten performances have already been held in La Scala. Art lovers can enjoy the opera until May. "We arrived at the main theater of Geneva. It was a tour organized by La Scala and we performed there. The performances were held at a good level. The audience warmly greeted us. I would say that I was pleased with the trip," he added. Opera singer has promising plans. Maharram will perform in the opera "Khovanshchina" by the Russian composer Modest Mussorgsky. He will play the role of a pastor. The premiere will be held on February 27. The opera will be broadcast on the Italian channel. For an opera singer, it's a very important performance as his childhood dream comes true. "I want to point out the most important fact that Valery Gergiev will conduct the opera. He is one of the most brilliant conductors of our time. When I got this news, I was extremely happy, because 6-7 years ago, when I was younger, I watched the recordings with Valery Gergiev and admired these concerts. I have never expected that I will perform in the opera conducted by him," said Huseynov. Maharram's future performances will take place in La Scala. "There will be three more productions in La Scala, but I would not like to now name the operas and roles," he said. Many concerts with his participation will be held as well. Moreover, opera singer prepares great surprise for his fans in Azerbaijan. "I may be able to come and sing in Azerbaijan. For me it is very important to perform at home," he added.